Kevin Harvick and the No. 4 Busch Beer Ford Fusion team for Stewart-Haas Racing have been the class of the field since they formed prior to the start of the 2014 Monster Energy NASCAR Cup Series season. They are likely to be fast again as they head to Martinsville (Va.) Speedway for Sunday’s First Data 500 and the first race in the Round of 8 of the 2018 Cup Series playoffs. The most impressive part of the No. 4 Busch Beer team might be different than what most would expect. Since the middle of July, the team has faced adversity and has had to look to its depth to fill four roles left vacant by a varying set of circumstances. Rear tire changer Daniel Smith, who joined the No. 4 team prior to its 2014 championship run, received a medical diagnosis in the middle of August that sidelined him for the remainder of 2018. The team turned to Michael Johnson, who came on board prior to the Aug. 18 race at Bristol (Tenn.) Motor Speedway and will fill the role for the remainder of the season. Mechanic Richard Bean, a member of the No. 4 team since 2014, also was lost for the remainder of 2018 for medical reasons following the Labor Day Weekend race at Indianapolis Motor Speedway. Shawn Warren stepped into his role and will stay with the team for the remainder of the year. In addition to the two teammates sidelined for medical reasons, front tire changer Shayne Pipala and tire specialist Jamie Turski also joined the No. 4 team since July. Pipala joined the No. 4 team July 18 and Turski joined Sept. 20. Each member of a NASCAR Cup Series team plays a vital role in the performance and overall success it is able to achieve on the racetrack – and the No. 4 team is no different. While the performance on the track has continued to function at a high level with new faces, it continues to get better every week as it continues to work together for a common goal. This week, as they head to Martinsville, Harvick and the team will have their work cut out for them. The shortest track on the NASCAR Cup Series circuit has presented a challenge for the No. 4 team since 2014. The track’s low banking and tight corners provide some of the closest and toughest competition on the schedule. Due to the tight quarters, a racecar rarely finishes a race at Martinsville without at least a tire mark on the door or a few dents in the sheet metal. What makes it maddening for competitors is that they can race to the front of the field and stay there throughout the majority of the event, only to get shuffled back on a late-race restart if they wind up in the outside lane. Harvick and the No. 4 team suffered that very fate at Martinsville in April 2016, when he started 19th, raced to the front and led 72 laps before being stuck in the outside lane on consecutive late-race restarts, ultimately finishing 17th. But the madness of Martinsville can work to a driver’s benefit, as well. Harvick found that out in April 2011, when he started ninth, led just six of 500 laps and beat runner-up Dale Earnhardt Jr. to the finish line by .727 of a second. Harvick and the No. 4 team have finished fifth in their last two appearances in Martinsville and would like to continue that streak this weekend in the First Data 500. The No. 4 team has shown speed with two top-five finishes, three top-10s and 265 laps led and ranks sixth in total points over the span of his nine Martinsville starts since the start of 2014. Kyle Busch of Joe Gibbs Racing, the current points leader entering the Round of 8, holds a one-point advantage over second-place Harvick. The No. 4 team also holds a 39-point advantage over fifth-place driver and SHR teammate Clint Bowyer for the final transfer spot. 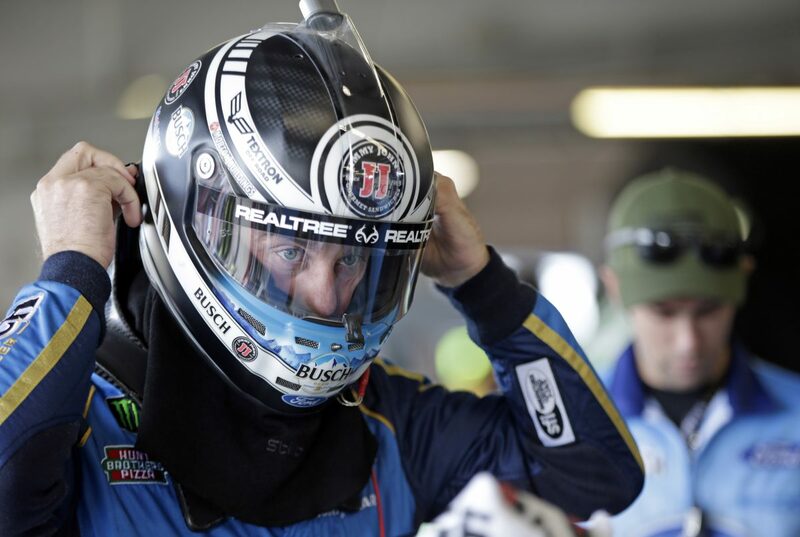 A win this weekend at Martinsville would secure Harvick’s position in the winner-take-all, Championship 4 round at Homestead-Miami Speedway and give him a shot at his second Cup Series championship. Where do you want to be at Martinsville to help you avoid trouble on the racetrack? Does winning a grandfather clock mean more to you than other trophies? With two kids, is there more Halloween planning now?